Kenna and Michal were the flower girls in a wedding this past weekend. They have unanimously proclaimed it, "the best day of my entire life." This picture was taken during the cocktail party prior to dinner. It was in a beautiful room in an old hotel in downtown Chicago. The room had large arched windows with wide marble window sills. During the ceremony everyone was given little bells to ring. The girls are looking at the extra little bells they collected in their baskets following the ceremony -- just one of many very important flower girl jobs! More pictures to come . . . They are beautiful flower girls! This is a GORGEOUS, GORGEOUS picture and would make a lovely card. Wow! They are simply beautiful! I can't wait to see more pictures. A stunning photo of your stunning girls!! They are such beauties! Their happiness and personality radiates in your photos. Wow! That is a BEAUTIFUL picture!!! Just breath taking!!! They look beautiful. I love this picture! Beautiful pictures! The girls are growing up so fast, hard to believe I met them nearly 2 years ago in Bountiful! what a gorgeous pic! thank you for sharing. 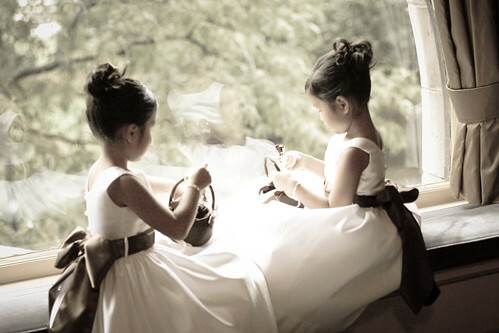 I can only imagine how your two fancy girls must have loved being flower girls! And what beautiful flowers they made! Are you renting them out for weddings? Because I might need your contact information. I just love your blog and I love this picture. So sweet. They are growing up so fast. Oh Kristi...they look beautiful and I love this image that you captured. Your photos are absolutely wonderful. Beautiful Girls cant wait to see more pics! !